The Security Council today extended the mandate of the United Nations mission in the Democratic Republic of the Congo (DRC) for another year, warning that the humanitarian situation remains of great concern, as well as the delays in preparing for the November presidential elections. In a newly adopted resolution, the 15-member body urged the Government of the DRC to hold accountable those responsible for violations of international humanitarian law or violations and abuses of human rights, in particular those that may amount to war crimes and crimes against humanity, including those committed in the context of the electoral process. 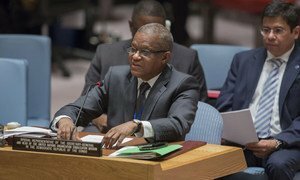 One week ago, presenting his latest report to the Council, the Head of the UN Organization Stabilization Mission in the DRC (MONUSCO), Maman Sidikou, said the country is at a “critical juncture” with rising political tensions ahead of the elections, which could lead to violence. Addressing the political situation, the Security Council today called on the Government and its national partners, including the national independent electoral commission (CENI), to ensure a transparent and credible electoral process. Further, the text calls on for a comprehensive electoral calendar for the full electoral cycle by the CENI. It calls on the Government to put in place an adequate electoral budget and an electoral code of conduct, and to carry out “without delay” a credible update of the electoral register. On the issue of armed groups, the members called for the urgent resumption of joint operations by the FARDC [the Armed Forces of the DRC] and MONUSCO to ensure all efforts possible are being made to neutralize the FDLR [Democratic Forces for the Liberation of Rwanda] and other armed groups. The Council also condemned the “brutal” killings of more than 500 civilians in the Beni area since October 2014, calling for a “thorough and prompt” investigation into these attacks. Regarding the protection of civilians, the resolution calls on MONUSCO to enhance its interaction with civilians to raise awareness about its mandate and activities through outreach programmes, to strength its early warning mechanism and to increase its efforts to monitor and document violations of international humanitarian law, including in the context of elections. The 15-page document also focuses on child protection, sexual violence and abuse, requesting that MONUSCO take fully into account child protection and gender considerations as “cross-cutting” issues throughout its mandate, recalling the UN's zero-tolerance policy on sexual exploitation and abuse. Turning to humanitarian access, the Council demanded that all parties allow and facilitate the “full, safe and unhindered access of humanitarian personnel, equipment and supplies” and the timely delivery of humanitarian assistance to populations in need, in particular to internally displaced persons. The resolution further decided that MONUSCO should maintain an authorized troop ceiling of 19,815 military personnel, 760 military observers and staff officers, 391 police personnel and 1,050 personnel of formed police units, while taking note of recommendations from the Secretary-General to reduce the Force by 1,700 troops. The Democratic Republic of the Congo (DRC) is at a critical juncture, with rising political tensions ahead of elections which could lead to violence if left unaddressed, the top United Nations official in the country warned the Security Council today, while highlighting key issues for consideration as it renews the UN's mandate there.